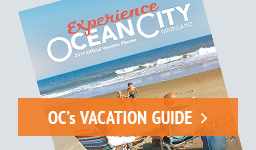 Get A Taste of Ocean City, Maryland! Something about being on vacation makes a person hungry. Whether you’re stepping off the beach or stepping out in the evening, Ocean City, Maryland restaurants are ready for you. From spicy Maryland steamed crabs, to thick, sizzling steaks…from seafood caught just offshore to crisp, juicy Eastern Shore fried chicken. You’ll enjoy fresh produce from family farms right next door: ripe red tomatoes, just-picked sweet corn, juicy peaches and more. You’ll find classic fare from the Boardwalk that USA Today named one of the nation's best: pizza and pit beef; burgers and wraps; hot, fresh french fries and overstuffed sandwiches. And of course, our world-famous salt water taffy, and thick, sweet fudge for dessert. Ocean City Boardwalk restaurants won’t disappoint! And you’ll fall in love with all of our fine dining options. In fact, Ocean City’s culinary scene has never been more alive, with new restaurants opening and passionate chefs who insist on fresh, locally sourced ingredients. Come experience the best restaurants in Ocean City, Maryland!